In the mid-seventies, two economists, friends and serious audiophiles - Dr. William Conrad and Dr. Lewis Johnson - were highly dissatisfied with the commercially available equipment of the time and were also perplexed and challenged by the readily apparent sonic differences among components in their own systems. What made these two classic tube systems sound so different? Could the virtues of each be somehow combined? Not content to merely speculate on such issues, conrad and johnson decided to systematically investigate by developing and refining a vacuum-tube preamplifier. 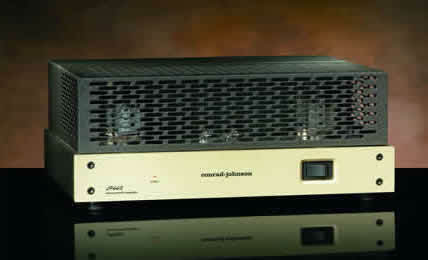 The resulting conrad-johnson preamplifier was immediately recognized as a state of the art contender and catapulted Conrad and Johnson into the audio industry. 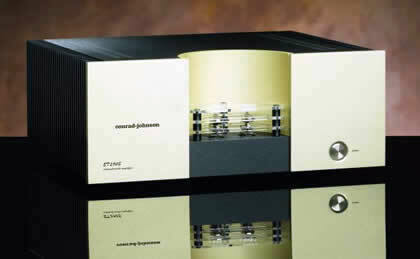 With the 1996 introduction of the Anniversary Reference Triode (ART), Conrad/Johnson established a benchmark for line-stage preamplifier performance that reigned supreme for most of a decade. 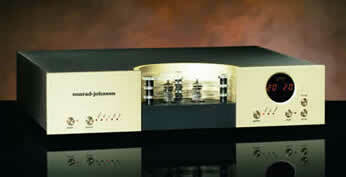 Reviewers were unanimous in their praise, proclaiming it the finest sounding preamplifier ever manufactured. In 2004, the ACT2 line stage brought new materials technology and refined power supply design to the composite triode circuit pioneered by the ART, once again elevating the state of the art. As has been our tradition at Conrad/Johnson, these technical advances are now offered in a more cost effective near state of the art design, the CT-5 composite triode preamplifier! The composite triode circuit is a conceptually simple design, based on creating a single "super" triode by paralleling sections of individual tubes. In this way, the entire amplification circuit can be reduced to a single active stage, without buffers or feedback. Any active circuit element will color the sound, whether the element is an amplifier or a buffer stage. By designing a line stage consisting of a composite triode, we are able to reduce the circuit to the absolute minimum active element! The result is an astonishing improvement in dynamics and dynamic shadings, as well as focus! 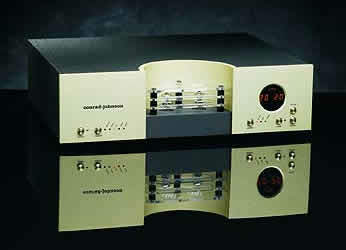 The Conrad/Johnson ET-2 is a remote-controlled vacuum tube preamplifier designed to serve as the control center for high-performance audio and audio/video systems. The ET-2 features a sophisticated level control circuit designed to allow precisely repeatable level and balance settings with adjustments made in .5db increments. With seven inputs, the ET-2 will accommodate elaborate audio systems. The ET-2 includes a Theater Loop which provides a locked unity gain setting making it the ideal component for listeners who want to integrate home theater into their stereos without compromising the performance of their primary music systems! The Conrad/Johnson ET-2 zero-feedback line stage circuit consists of a single-ended triode amplifier using a high current vacuum tube. A direct coupled buffer stage provides a low output impedance to insure that the ET-2 can comfortably drive virtually any combination of interconnect cable and power amplifier. This circuit's simplicity pays dividends in total integrity and seductive musicality while offering flexibility in system matching. Also, the ET-2 is optionally available with a choice of two built in phono equalization preamplifier stages (a high gain stage and a low gain stage) to provide the additional gain and RIAA equalization that phono cartridges require. The phono section uses two triode amplifier stages to provide gain. A passive network of precision components accurately provides the required frequency compensation. The Conrad/Johnson Enhanced Triode Amplifiers are power amplifiers designed to capture the best attributes of both fine vacuum-tube designs and of the best solid-state designs. The Conrad/Johnson ET-250S is a 250 watt per channel stereo amplifier, offers the refinement of a vacuum tube amplifier with the guts and control of a solid-state amplifier. Negative feedback is an engineering technique used to reduce measured distortion. While feedback does achieve this goal, it also introduces aberrations in the transient response characteristics of the circuit. We have found that eliminating loop negative feedback can result in much finer gradations in dynamic response (micro-dynamics) and more accurate decay on musical transients. But eliminating negative feedback requires much more care in the design of the circuits-both in choosing devices and in power-supply design, and places greater demands on the parts. Consistent, with Conrad/Johnson's design philosophy that circuits should be kept as simple as possible; these amplifiers work their magic with a minimum of vacuum tubes, seven to be exact. A composite triode input stage is direct coupled to a cathode-coupled phase inverter. The output stage is comprised of 6550's operated in ultralinear configuration one pair per channel for an optimum combination of high power and low distortion. Conservatively rated at 60 watts per channel, this amplifier provides sufficient power for most applications. Limited negative feedback is applied to the circuit to reduce distortion and provide a sufficiently high damping factor to control real-world speaker systems. Discrete DC power supply regulators are provided for the input and inverter stages, in order to isolate each stage from the output signal. As with all Conrad/Johnson amplifiers, these amplifiers require no complicated adjustments or specialized equipment to maintain. To assure peak performance, the owner need only make a simple bias adjustment when new tubes are installed. Built in LED bias indicators allow the user to make this adjustment using only the supplied screwdriver. Component parts quality is a signature strength of any Conrad/Johnson product. The audio circuit and related power supplies feature precision metal film resistors and high-performance polypropylene capacitors. There are no electrolytic capacitors in the audio circuit or related power supplies. Proprietary wide-bandwith output transformers contribute to excellent high frequency performance. Even the input and output connectors and internal wiring have been carefully selected for optimal sonic performance! Users who have not previously experienced the dynamic range and life-like timbre of tubed components will find will find the Conrad/Johnson LP-66S an ideal introduction to the joys of modern tubed equipment!